360th day of the year. There were then 5 days left in 2018.
on the 52nd week of 2018 (using US standard week number calculation). 6th day of Winter. There were 84 days left till Spring. December 26, was the 2nd of the 12 days of the Christmas Season (Twelvetide). December 26, 2018 was the 1st day of Kwanzaa. 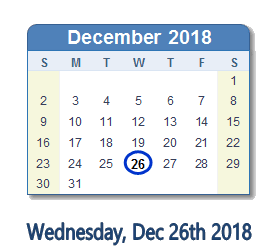 What happened on December 26th 2018?